Rehearsals are scheduled for Friday evenings at 4:00, 5:00, and 6:00 p.m., in the order requested. Rehearsals start promptly and are intended to ensure a smooth ceremony, so all who have a role in the wedding are expected to be present. Please be prompt. The rehearsal does not include music. Please tell all rehearsal participants to enter at the location indicated on the wedding invitation. A total of three weddings may be held on a Saturday. No ceremony is held simultaneously with another. In order to accommodate the demand for wedding time and space, one wedding party may be scheduled to arrive at the church at the time the preceding party is scheduled to depart. The time and space alloted to each party is determined with the wedding coordinator according to existing schedules and church policies. Each wedding at Fourth Presbyterian Church has a two-and-a-half-hour window of time for preparations, the ceremony, and post-ceremony greetings and photographs. Wedding parties and their service providers may arrive at the church one hour before the start of the wedding ceremony. Due to other events and activities—including other weddings—the church is unable to accommodate early arrivals. Specific spaces, including dressing rooms and worship facilities, will be reserved for the wedding party and guests. These space reservations will be outlined in the timeline provided by the wedding coordinator. Wedding parties and their guests will be expected to depart from church space no later than one-and-a-half hours following the scheduled start of the wedding service. A dressing room is available for the couple’s use on the day of the wedding. All other members of the wedding party are expected to arrive dressed. Facilities are provided for final grooming. There are no parking facilities available at the church for use by the wedding party, wedding guests, photographers, or other service providers. The most convenient parking facility is located in the Bloomingdale’s building (900 N. Michigan) at the corner of Delaware Place and Rush Street (entrance on Rush Street or Walton Street). There is no discount parking available on Saturdays. 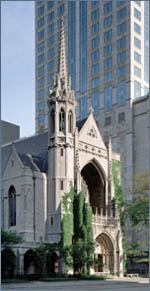 The facilities of Fourth Presbyterian Church are in constant use by a number of groups. 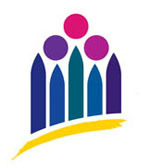 Our commitment is to provide the best possible experience for all people using the church facilities. Please be considerate of those who are here for purposes other than for your wedding. We ask your courtesy in helping to keep the church complex clean and litter-free. Please refrain from throwing rice, birdseed, confetti, flower petals, potpourri, or any other substance either inside or outside the buildings. The release of balloons and live animals and the lighting of sparklers is prohibited. In our experience, the most effective way to greet the newly married couple is to ring the church bells as the couple leaves the Sanctuary. There are no checkrooms or secure package storage areas in the Sanctuary or chapels. Please discourage guests from bringing gift packages to the church. No child care services or nursery facilities are available during weddings. Parents should make private, off-site babysitting arrangements for children whom they feel are too young to attend the wedding service. Fourth Presbyterian Church is a smoke-free environment, and alcoholic beverages are not permitted on the church premises at any time.